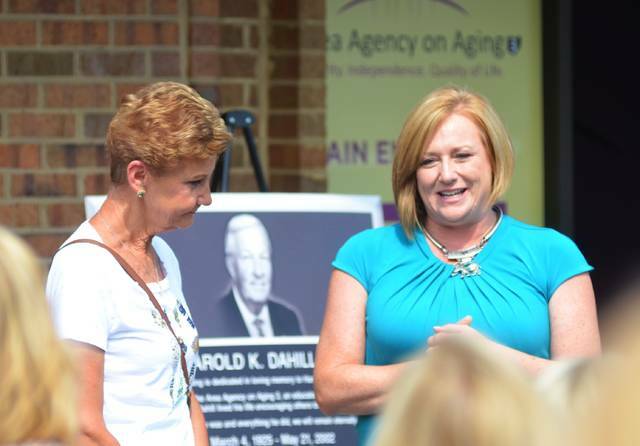 Dee Kemp, left, and CEO Jacqi Bradley, right discuss the impact Kemp’s father, Harold Dahill, had on the agency. LIMA — To deal with expanded demand, the Area Agency on Aging 3 has opened up a second office specializing in elder abuse. Dedicated as the Harold K. Dahill Center Wednesday, CEO Jacqi Bradley said the agency expects a higher caseload as baby boomers increase in age, and the expansion, a 16-person office located 50 feet from its main location on Allentown Road, should help breach the gap. Traditionally, AAA3 provides a high level of home care for elderly populations, but if local trends are taken into account, the amount of funding required for the same level isn’t available to cover the entirety of the aging population. Instead, Bradley said the nonprofit is switching gears to push for prevention and management of chronic illness to make the most with its budget. Bradley said that type of innovation makes it a perfect time to name the agency’s new building after Dahill, a former leader of AAA3 who grew the agency by constantly looking for innovative programs and funding sources. Bradley had originally been hired by Dahill when she first started with agency, and he was well respected during his time at the agency, refusing to be called by anything other than Mr. Dahill. Dahill died in 2002. His family also attended the dedication ceremony. Before AAA3 renovated the building, it housed a doctor’s office and video production company. Now it will be used as the center of a new elder justice program called “Awakenings,” funded by a federal Department of Justice grant. Bradley said roughly 1,200 people utilize the elder justice programs and that problems of individuals taking advantage of elders or mistreating them do happen in the region more than people realize. AAA3 is the regional entity of a statewide nonprofit funded mostly by state and federal funds meant to localize programs that affect elderly populations. The agency offers services in Van Wert, Putnam, Allen, Hancock, Hardin, Mercer and Auglaize counties. https://www.limaohio.com/wp-content/uploads/sites/54/2018/08/web1_DahillCenterO.jpgDee Kemp, left, and CEO Jacqi Bradley, right discuss the impact Kemp’s father, Harold Dahill, had on the agency.